It’s mid-Spring now and the assembly of plants in the woodlands have made the scenery quite green compared to a month ago. The trees are leafed in for the most part, although a few oaks still have small leaves. Shade is dappled under the trees that don’t have all their leaves emerged just yet. Walking in the woods now has a different feeling. Sure, there are still plenty of crunchy leaves to trod upon, but the view is quite different. With all the trees, shrubs, vines and herbs growing up and pushing their leaves out, the woods have a closed-in feeling. It feels like there is less room in there compared to a few weeks ago when you could see all the way through the woods. Since each season is about three months long, we can say that each season has an early, middle and late period with each period lasting about a month. 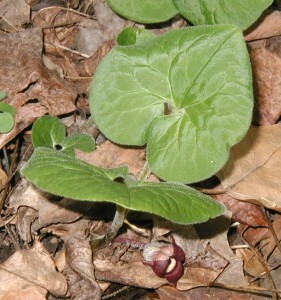 During early spring Wild Ginger, Asarum canadense, emerged from the ground with their leaves a bit crinkled. Wild Ginger is a woodland perennial native to the Eastern US. Its leaves rise up from an underground stem, or rhizome, and the plant spreads out from this rhizome each year. It’s blossoms should be visible during mid-Spring. Colony of wild ginger growing next to a creek. 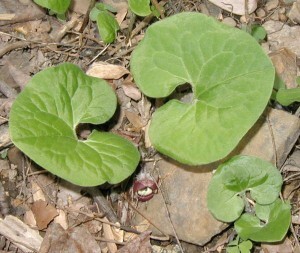 The rounded, heart-shaped leaves of wild ginger rise up in pairs from the rhizome. Two leaves are connected to each other in a Y-shape. 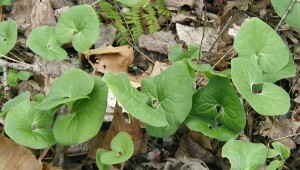 Wild ginger spreads out and makes a nice ground cover with its leaves reaching a height of only 4 to 10 inches. A patch of wild ginger is eye-catching in a native plant garden. Flowers of wild ginger must be sought out or you’ll never see them. The leaves hide the flowers out of sight and the flowers are not where you might expect them – at ground level. Sometimes the flowers don’t even push out of the ground all the way and remain partially covered by a layer of soil or old leaves. There is a single blossom that sits in the crotch of each pair of leaves. A pair of wild ginger leaves and one flower. 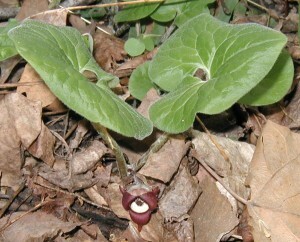 The two leaves of wild ginger often hide its single maroon to brown blossom from view. Wild ginger blooms are cup-shaped with three lobes giving it a triangular appearance. The flower stalk and flower are covered with hairs that make it look quite fuzzy. The flowers are light-colored on the outside with a maroon interior. They must be pollinated by ants or some other ground-wandering insect. Front view of wild ginger flower. Note the soft hairs all over the leaves of wild ginger. 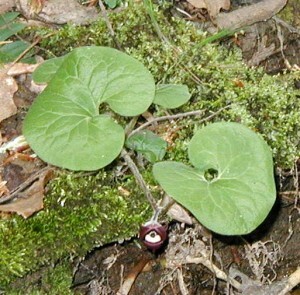 Looking down on the heart-shaped leaves and maroon flower of wild ginger. Wild ginger flowers are coated with long hairs. The leaves and stems are covered with short hairs. Wild ginger plant growing at the edge of a creek. 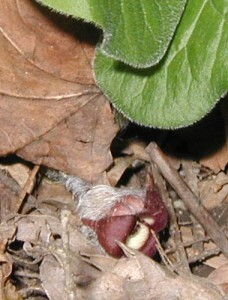 The flower of wild ginger rises out of the crotch of two leaves. Wild ginger requires a moist to wetland, woodland habitat. Places like the edges or lowlands of creeks or rivers are good places to look for wild ginger. Photos were taken 18Apr2010 at Little Buffalo State Park. Wild ginger can be seen in many places in the Day Use Area, near the covered bridge, along the Mill Race Trail, and at the upper west end of Middle Ridge Trail. A few years ago I bought a wild ginger plant at a Native Plant Sale and planted it on the east side of our house, right next to the house in an area that receives mostly shade. Each year the ginger has come up a little bigger than the year before. This year there are seven pairs of leaves. If you are lucky enough to find wild ginger for sale try planting it under a tree to mimic its native habitat. It would make a nice ground cover and at the same time it would receive the shade it requires to thrive.